22, of Lee, Maine; assigned to the 2nd Battalion, 8th Cavalry Regiment, 1st Brigade Combat Team, 1st Cavalry Division, Fort Hood, Texas; died June 23, 2007 in Taji, Iraq, of wounds sustained when an improvised explosive device detonated near his vehicle. Also killed were Army 1st Lt. Daniel P. Riordan, Army Sgt. Jimy M. Malone and Army Spc. Derek A. Calhoun. To honor SGT Joel A. House, his parents, Mr. Paul House and Mrs. Dee House retrieved this stone from a small swimming hole near their camp in Lee, Maine. Watch this video to learn why this stone is significant and what it says about SGT Joel A. House. I pull back now when Paul pushes. The days of jumping at the sound of his voice are behind. I didn’t know there was no reason to jump. Not purpose. Not habit. A decade of steering a career as a private school teacher has opened the door to teach at the American School of Monterey. I wanted to be a writer, but life just happened with all the jumping around. When I landed, I was a high school teacher who could never quite understand the politics of the schoolhouse. Budget cuts in rural Maine pushed me again, but this time I was different. I was stampeding towards a new dream. But right now, twenty-nine years of marriage, living in this town, and raising three children was pulling me back in a re-memory of my life. “I thought sitting on the porch at camp on the longest day of the year, watching the loons and the sunset, was how you wanted to spend your birthday?” Paul says. I tune him out until I hear, “Who’s here now?” A blue van with military plates has pulled into the driveway. “We’ve lost Joel,” he walks back into the kitchen. “What?” I look up from my Mac. It was actually my son’s computer. He’d bought a new one to play video games on while on his second tour in Iraq. He’d been home on leave three months earlier. His brother, sister, Dad, and I went to Best Buy with him. “Are you Deanna Arlene House?” one soldier asks. His voice is tight. “Yes.” I’m saying, ‘yes’ but screaming ‘NOOOOOO!” ‘Not my baby, massah’ ricochets from an old slave movie I watched only one time in high school and couldn’t bare that mother’s loss, so I never watched it again. “Yes.” The one I carried while his 4-year old brother battled brain cancer. The one I rocked and wrestled. The guitar wielding soccer player who loved “Tour of Duty” and James Bond video games. I’m the one who knew his deepest secrets, fear of dying, fear of talking with people, and fear of not being smart enough around those people. We had him tested–twice–and he didn’t have a learning disability. There was definitely something. Maybe the Army could help him. “Are you sure?” Paul, who is standing behind me, asks. “May we come in?” a soldier asks. “All of her family is traveling. They are on their way back from the beach,” Paul states. Paul gives me the phone. He turns to the soldiers to ask details. “We can’t give you many details, Sir. Tomorrow your casualty assistance officer will contact you. He will have reports.” Paul continues to ask them for details. I am completely honored and humbled to be carrying the stone in memory of Sgt. House. All have given some, some have given all. This memory and his legacy will be with me for a lifetime. May 23, 2014 will always be a memorable day for Darlene and I. We knew two months ago this was going to be something truly special, but we had no idea to what extent. That morning we awoke to drizzle/rain in Brunswick, but we didn’t hesitate or care one bit. Joel never got a choice on the weather when he was serving so this was completely minor. Our first arrival on Pleasant St in Brunswick brought a lot of excitement from our chapter. Members were completely thrilled to be a apart of this. When we arrived in Portland the excitement definitely grew. The media coverage, boy scouts and other fellow riders were present. We were presented Joel’s memorial stone from a young cub scout that was probably 6-7 years old. As he read the card he struggled with some of the words, but HE READ IT, ALL OF IT. A very moving moment for us. As we traveled north on 95 I felt this lump in my throat knowing I was carrying something very special. As we arrived at Dysart’s for lunch, Darlene grabbed Joel’s stone and we brought him to lunch. What a great thought on her part. When we arrived at the Medway rest stop I could tell, first with myself and then with the rest of the group, that emotions were starting to build. Tears were flowing, hugs were everywhere. Yes we may be a bunch of bikers, but we sure do love our service men and women and what they’ve done for us and continue to do. When we arrived and the bag pipes were playing, my heart really started to race. I was thinking, just hold it together for a short while longer. When we gathered as a group, I leaned over and said to Darlene, “there they are”. I recognized both of you from the video above. Words could not describe how we felt as we met and presented you with Joel’s stone. He was young, way too young, to be taken from you and our great state. But, his memory and legacy continue through the work you’re doing with House in the Woods (www.houseinthewoods.org). What a tribute and foundation!!!! The hikers were told to pick up their stone at Thompson’s Island. When I arrived I saw them all laid out on a table. So many stones…. I had asked to hike with Army Sgt. Joel House’s stone because I had met both of his parents at other events. I spoke with his father, Paul, at Baxter State Park where he shared memories of Joel hunting and fishing and he told me about the House in the Woods organization that he started in his son’s memory. It is a wonderful program that helps other Gold Star families and veterans come to terms with their own loss through the same outdoor activities that Joel enjoyed. I spoke with his mother, Dee, at the Run for the Fallen where she told me about how much Joel loved the family camp and that is where they picked the stone that I would be carrying. I gathered up Joel’s stone and headed toward the bus. The ride to the trail was an event in itself as the driver, Red, was 90 years old and had been in WW2 as part of the first wave on Omaha Beach on D-Day. Unloading at the trailhead I stopped and thanked Red for his service and thought about how there are true heroes all around us. I hiked with a great group of people. Many were strangers at the beginning but by the end had become family as our team leader, Heather McGlauflin, said at the summit. During the hike, we talked among ourselves, sharing the stories of our soldiers. I took pictures of Joel’s stone during the hike to send to his parents so they could see where his stone had been that day. We as a group were focused and happy to be a part of the event – many smiles throughout and supportive comments. However, the closer we got to the summit, a much different attitude emerged as we knew the ceremony at the top was about to begin. We tried to keep our emotions in check as we laid the stones lovingly on the Maine state flag – to be honest, most of us did not have dry eyes. We each took turns talking about our hero and what it meant to us to hike with their stone. I thought a lot about Joel and how much we seemed to have in common. 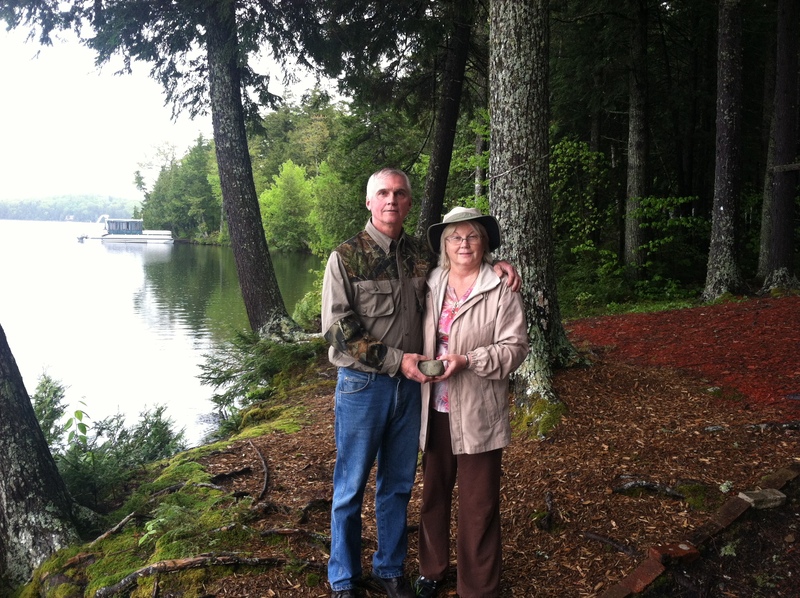 Our love of the simple life at camp, hunting, fishing….and family. I spoke of all those things and I also talked about his death… how he died too young from an IED that exploded near his vehicle on June 23rd, 2007, his mother’s birthday. I had asked Paul if there was anything pre or post hike that I could do for his family and he asked only one thing. So at the summit I asked for a moment of silence and we, as a group, said a prayer for Joel’s family and the other Gold Star families. This was a very emotional and important moment in the hike for me as I felt a real connection to Joel during the hike. Once the ceremony at the top was over, we headed back to Thompson’s Island to speak with the families, eat together, and then hand off the stones to the Patriot Riders. This was the hardest part of the event for me – to hand over the stone that I had been carrying all day to someone else. I was very protective of the stone and didn’t want anything to happen to it. The Patriot Rider that took the stone hugged me and told me that he would take good care of Joel. The strength of these Gold Star families humbles me and I want to thank Dee and Paul House for the honor of getting to know them and allowing me the privilege of hiking with Joel’s stone. I carried Joel’s stone for a day but will carry his story in my heart for a lifetime. Maine heroes will not be forgotten. On May 9 2015 I had the honor of carrying Joel’s stone in the Run for Heroes event in Presque Isle. I wanted to carry Joel’s stone because we share the same fierce commitment to our family and friends. At the event I met a gentleman (I didn’t get his name) but he stated he had spent time with Joel at camp during the summers when they were younger and he knew his family well. I struggled with my speech at the end of the event, at times pausing to keep my composure, and remember thinking that it is truly because of the selflessness and ultimate sacrifice that Joel and others have made that I am able to enjoy the freedoms we have. Thank you Sgt. Joel A House for your service. On May 29, 2015 It was my honor to carry the stone for Sgt. Joel A. House of the United States Army while climbing Bigelow mountain. 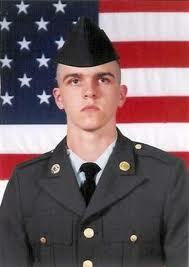 Joel died on June 23, 2007 due to wounds suffered by an explosive device detonated near his vehicle. He was only 22, he left behind his mother, father, his older brother and, sister. Joel joined the army shortly after graduation, because he wanted to do his part in protecting his friends, family and country. Joel had challenges with academics so he took part in hands-on summer camp programs, he also went to Mexico as an exchange student. From what I’ve read, in addition to serving his country Joel was a fine young christian man striving to find his mission to his Lord and Savior, Jesus Christ. As far as my experience it was quite the hike, I fell in a stream and being momentarily stunned I soaked up some water. Even though I was uncomfortable, sweaty, hot, and hurting, I walked with the pride of carrying the stone for someone who never gave up, and left fightin’ the good fight. This was my first summit project and I look forward to doing more in the future because the experience was very rewarding. This experience and his legacy will be carried with me for a lifetime. Sunday, May 24th began as it should at Twin Pine Camps, as a part of The Summit Project’s Baxter State Park weekend. As a light rain fell onto my face as I stepped out of the cabin at 5 am, the droplets reminded me of tears as they streamed down my face. Tears that were symbolic of your grief, but also tears from Heaven that Joel, and all our Fallen Heroes, were shedding in anticipation of the day’s hike. The day was extremely important in so many ways for me. It was an incredible honor to carry Joel’s stone, honoring him by keeping his life alive. It was also important for me personally, to share in the struggle of one’s grief. As I would soon realize, the day was full of symbolism, and I was attune to it. The woods and waters of this State are a refuge for me. It’s where I feel most comfortable and also make my living. When we spoke the afternoon prior to the hike, you spoke of Joel’s love for the outdoors; whether it be hunting, fishing, recreating, or relaxing. Of all my time in the woods, I never felt so connected to my surroundings as I did hiking to the summit of Owl Mountain. While our group talked, laughed, and shared stories; it was if aside from this, there was Joel helping me to truly appreciate the beauty around. As we walked from a gorgeous stand of portly maple and birch glistening in the early morning sunshine to a stoic stand of tall spruce with a carpet of lichen, I couldn’t help but really take in the majesty. Nature has a way of making your senses heightened, and I don’t recall hearing the rush of a swollen stream sounding so sweet, almost melodic. In all of this, I couldn’t help think of your son, his shared appreciation, and how he had some small part in this experience for me. You also spoke of Joel’s love of his family, friends, and fellow soldiers. I could connect with the stories of swimming at camp when younger, Joel’s witty side, or his relaxation by the fire. On our hike, it was his presence and guidance I most felt a connection with when relating to my fellow team members. It was the offering of a hand to someone else in overcoming an obstacle, the connection of starting out as strangers but completing our hike as family, and sharing the beauty around through shared observations. Perhaps the single greatest part of Joel’s legacy, and that of my fathers, was how we know they’re with us. You spoke of the beauty that results after a ferocious storm in the form of a beautiful rainbow, spread wide across the sky with its brilliant hues. This has, and continues to be, your affirmation of Joel being there for you in life. While our day broke to be clear and sunny, offering stunning views of the peaks around Mt. Katahdin and the valley below, it was what happened at the peak which truly told me Joel was present. Upon exiting from the scrubby brush that obscured the last quarter mile of the trail as we neared the summit, I was immediately taken aback by the enormity of not only the patchwork of granite rock and green forestland rising further above me, but by the sense of being in the right place at the right time. As I turned 360 degrees around, looking north, south, east, and west, it was what was above me that really resonated. A peregrine falcon; a symbol of liberty, freedom, and victory, moved effortlessly in the air currents above. It was at this moment, as if selected for me, that I knew Joel specifically, but all of our Fallen Heroes, were with us in spirit. As we organized the stones we’d carried for the circle ceremony, I kept watch of this falcon. As one of our team members, and active Army member, unfurled the Stars and Stripes he carried with him from Afghanistan, with its gritty sand still inside, this falcon disappeared. It was almost as if on cue, affirming a successful job well done. One of my most memorable moments of the entire weekend was coming back from the hike. As I exited the building to applause from the families and TSP staff, a feeling I was not prepared for, I thought of who I wanted to receive Joel’s stone. The previous day, you had mentioned not being able to make it. As I scanned the long line of Gold Star Families, I was truly moved when seeing all of you standing there. It immediately made me think of how Joel must have felt, completing basic training, graduating, and then marching in to search the crowd and finding your proud faces. I have no doubt Joel had a hand in the entire weekend. His being, while not physical, resonated from the moment I arrived. Just last week, while in the woods, I found myself coming to a height of land just after a rain storm had passed through. Alone, and with a cool guitar laden song on the radio, I stared out into the shimmering distance to see the largest vibrant rainbow. I knew then, that Joel would be with me for a lifetime. It was an honor to carry Joel’s stone, a privilege to meet your family so I may understand Joel’s life, and it’s truly inspiring to hear of House in the Woods with its legacy of giving back to our military men and women. On 13 Sept 2015, Justin Cloukey wrote – My name is Justin Cloukey and I live in Lincoln, Maine. I was the co-coordinator for The Summit Project Comes to Lincoln, welcoming the Honor Case to our area. The event took place on August 7th and was a unique combination of pride and humility, joy and sadness, pain and comfort. Lincoln community members, active and retired servicemembers and Gold Star family members walked side by side through the streets of Lincoln sharing stories of loved ones, emotions and displaying unity to remember Fallen Maine Heroes. As the case indicates, it was my honor to coordinate such an event with so many affectived lives taking part. Over the past 5 weeks, the case, stones and stories have proudly been on display at Machias Savings Bank’s Lincoln branch. My wife is the branch manager there, hence hosting the Honor Case at the facility. The staff have diligently stood watch, educating those showing interest on a daily basis. My hat goes off to their preparation, dedication and commitment. This past week I had an incredibly unique opportunity. Emily Leonard, the aunt of my good friend since childhood, was nearing completion of the Appalachian Trail. She started her journey on March 9th, 2015 at Springer Mountain in Georgia. The plan was to summit Mt. Katahdin on September 9th, 2015, 6 months from her start date. My wife and I had been following her blog and discussed how great it would be to meet her at Baxter State Park and join her for the completion of her hike. My friend, Sean, and I coordinated our schedules and planned an overnight with Emily and her husband, Bruce. While making arrangements, my wife suggested I bring the stones of Army Sgt Blair W Emery and Army Sgt Joel A House. This was a great idea because not only did have the personal connections of knowing the families and working with ‘House in the Woods’ organization, but both Emily and Sean knew of the men through their school (Lee Academy). I packed my bags and stones and made my way north. Sean and I stopped at a local store in Millinocket for a “quick” snack pickup on our way to the park. The man inside noticed the TSP magnet on my Jeep and asked how I was involved. I proceeded to tell him my stories and meeting up with Emily, aka “Black Bear”. Zachman asked to see the stones and I retrieved them from the vehicle. That’s when our quick stop became a time to share. Several more people showed up, some with connections to TSP and some simply interested in the concept. It’s interesting to note that NOBODY made it into the store when we were outside; all waited until we departed before carrying on with their day. An early start of the Hunt trail proved difficult quickly. With Joel’s stone in my pack and Blair’s in Seans’, we marched forward into the humid wildnerness. I became fatigued and tired much more quickly than anticipated. The fog added denisity to the already heavy air. Both Sean and I realized we were in more trouble because we had the distinct disadvantage of not having 2,000 trail miles belts like our fellow journeywoman. As was the mindset of Joel and Blair, we must go forward, perservere and press on. A pitstop at the magnificant Katahdin Stream Falls gave our legs a chance to rest as I interviewed Emily about her experienes and expectations for the remainer of the day. It was then I saw the strength of Emily as she took possession of Blair’s stone from Sean. The AT had NOT made her weak, it had made her STRONG. It reminded me very much of the military. Giving strength to the men and women who protect and serve, just as Joel and Blair did. At the summit, I had an overwhelming rush of emotions that last at least half of the hike down the mountain. I was elated for Emily on her acheivement, thrilled for Sean as this was his first summit of Katahdin and tearful as I attempted to explain the meaning of the stones to on-lookers. I feel my, what seemed to be, lack of understandable words was masked by the tears in my eyes, cracking of my voice and willingness to continue speaking to share their stories. The end of the day brought a different kind of conversation in the vehicles. Ones of honor, commitment, appreciation and support of our military. I am forever grateful to both our servicemembers and TSP for forever changing how I remember Maine Heroes such as Joel and Blair. I kept reminding myself that sore legs and a tired back are trivial in comparison to what Joel, Blair and so many others have endured and given for my freedom to climb that mountain and live this life. I can only pray that future TSP and Honor Case volunteers can be affected as I have been and wish the UMaine crew and beyond much success as I deliver the Honor Case to them in the following weeks. I have spent the last couple of days since the TSP @ ANP event reflecting, gathering my heart and soul, and attempting to put on paper just how to thank you for the life changing event of carrying Sgt Joel A House’s stone to the top of Cadillac Mountain. I am not a morning person by any means – however, waking at 430 on Saturday October 17, 2015 was the easiest wake up call I’ve ever had. I was energized, ready, and alert more than ever in my life. Thompson’s Island was coming alive as the stones and people arrived, and the sunrise was just magnificent, like a smile coming across the bay. It put my nerves about being out of my comfort zone at ease immediately. Team Blackwood was tasked with the South Ridge trail – a gorgeous ascent with views of the harbor beyond compare. We got off the bus and as we walked to the Trail Head, the clouds opened up in large icy raindrops, a somber start to the hike. However – no weather was going to hold us down – we forged on arriving at Eagles Crag – drizzling and chilly and cloudy. Unpacking our stones to take a photo at the magnificent elevation, the rain seemed to stop – and as we all individually were climbing back to the trail a spot opened up in the clouds to the left over the bay and the sun blazed through as if to tell us “we are all here”. It was breathtaking. Just as we crested the first area of tree line – a rainbow appeared to the left – short lived but stunning – the pat on the back from our Heroes we all could feel. Smiles and discussions and reflections ensued – by these team members that started as strangers and were quickly becoming a solid foundation glued by our mission and unified goal. We all discussed our Hero in depth – laughing at idiosyncrasies between each hiker and hero, and trying to hold back tears when deeper conversation brought to light the sacrifices our heroes have made. We reveled in the honor of just getting to know each hero as intimately as we could. I personally hiked with a music playlist I created – half of the music I enjoy – and half of Joel’s favorites that I found during my research. “Simple Man” played over and over at one point – accidentally by a button pushed – however, I did not change it. I hiked in silent tears at points, thinking of how the lyrics spoke to a parent’s wish for their son and how Joel’s life was cut short of some of these hopes all parents have for their children. When the air got thin, and my body wanted to stop – Joel’s memory carried me on, pushing to finish what I started. The video of him playing guitar while the song played in my ears ran in repetition in my brain. The Summit Ceremony was moving and full of emotion from everyone when relating the stories of our individual heroes. It was impossible to not hold back the flood of tears and gratitude I had for Joel and his sacrifice. I was fortunate that Joel’s cousin, Amanda and I were introduced by the fire at the base camp. Two strangers who had never met – Joel clearly placed us there at the same time. She laughed and her eyes lit up as she talked about how close her and Joel were – how he would constantly pull pranks at camp, and the story about her ruining his favorite Ninja Turtle sleeping bag. It was very evident just what a wonderful person he was, and how greatly he is missed by everyone who loved him. When it was time to hand the stones over to the Patriot Riders – I offered his stone to her to give back for the ride – there were plenty to hand across – she stated “finish what you started” – one of the most memorable pieces of this journey. I am eternally grateful that I had the honor to carry Joel’s stone on my first trek with TSP. Like your first love – it will be the one I never forget every single detail about. I will continue to tell his story – encourage everyone I come in touch with to honor our Maine Heroes. I hope to meet you all soon, and pray that your continued work with House in the Woods brings veterans the respite they so desperately deserve. Thank you again for allowing me to ensure our Maine Heroes Are Not Forgotten. I will be transporting Joel’s stone along with my husband during the Summit Project ride on 5/28/16, with the Patriot Riders Chapter 3. Having known Joel and his family since I was 12, this is an honor for me. I also look forward to passing Joel’s stone to Amanda Carey on arrival in Millinocket, Joel’s cousin and my best friend for the past 19 years. Two weeks ago as you know I carried Joel’s’ stone to the summit of Owl Mountain. I know known since October 2015 that I would be carrying his stone on Memorial Day weekend. It is something that I looked forward to since the day I knew. I have not climbed in Baxter since we climbed Katahdin that last time with Jeremy and Joel. The one when I had that haircut that made me look like the Hanson brothers. The one where Joel called me a baby because Jeremy carried me across the plateau on his back! The hike that Joel and I were so proud of! We made it, we had made it to the top of Katahdin! We were finally part of the big kids, we didn’t have to stay at Katahdin Stream campground with the adults and pass the time by swimming in that FREEZING cold water!! May quickly came and I found myself more and more nervous for the hike I was about to take. Every day I was thinking about what I would say when we reached the summit and how I could make everyone in my group realize how great of a person Joel was. I rehearsed it in my head thousands of times. It was finally the week of the hike. Saturday seemed like it was an eternity away. I was flooded with emotions that week at work. Every time someone talked about what I was doing for Memorial Day weekend I would tear up and tell them with pride that I was going to carry the stone and story of my cousin who was taken from us too soon. Saturday arrived, I was going to be receiving Joel’s stone from a Patriot Rider. A rider whom I have called my best friend for the last 19 years. Someone who Joel teased more times than I think he teased me! She’s my girl and I couldn’t imagine a better person to bring his stone to me than Nicole. The waiting at Twin Pines seemed to take forever. Finally, we hear the roar of the bikes coming with our heroes! All I could do was smile! Knowing I was about to honor Joel in a way I never knew was possible! He was going to carry me up that mountain! Sunday morning arrived, it was cloudy, 60% chance of rain and my ideal hiking conditions! We boarded the van. I climbed in the way back and noticed very quickly that my seat was wet and it smelled like wet white water rafting gear! My first thought “Joel, really?! That is your one and only joke you get to play today!” As you know, he loved to tease and play jokes on me! That was definitely his way of letting me know he was with us. Quiet conversation during the ride about our heroes and getting to know one another didn’t mask the smell! When we approached Katahdin Stream Campground we unloaded, did one more gear check and started our way to the summit! The hike was rigorous, wet, windy and pretty chilly. A lot of us were in shorts and as we approached the treeline began to layer up! It was COLD and wet! We stopped just before the treeline to share our stories of our heroes. I went first. Nervous is an understatement. I boasted about how great of a man Joel was and how lucky I was to have him in my life for 22 years. He was my best friend. My first friend. His memories will forever be in my heart. After the discussion and sharing the stories of our heroes we continued to the summit. We walked into the clouds. One of the team members said “It’s like we’re sharing the heavens with our heroes!” And it certainly was! We could feel their presence. Finally, we arrived back to base camp. I walked into the room with all the family and friends who were there to greet us. I see a familiar face and am so thankful to have Aunt Dee there waiting for me when I get back with Joel’s stone. We exchange a smile and I boastfully say “Today I carried the stone and story of Sgt. Joel A. House” I am welcomed with a nice warm hug and an “I love you, sis.” Mission accomplished! This is a day that I will hold forever in my heart. Joel may not have been with me in person, but I know that he carried me up and down that mountain! Two weeks ago as you know I carried Joel’s stone to the summit of Owl Mountain. I know known since October 2015 that I would be carrying his stone on Memorial Day weekend. It is something that I looked forward to since the day I knew. I have not climbed in Baxter since we climbed Katahdin that last time with Jeremy and Joel. The one when I had that haircut that made me look like the Hanson brothers. The one where Joel called me a baby because Jeremy carried me across the plateau on his back! The hike that Joel and I were so proud of! We made it, we had made it to the top of Katahdin! We were finally part of the big kids, we didn’t have to stay at Katahdin Stream campground with the adults and pass the time by swimming in that FREEZING cold water!! “I feel honored to have carried Joel’s stone. I felt very proud to know that this brace hero was in my hands. We climbed Table Rock Mountain, and even though it was hard, Joel brought me right back up every time I got tired. He gave me a mission. This non-profit program is the best part of all! You are giving Joel a second chance at life., Thank you very much! A second camper carrying his stone would like to add their experience. “It was an honor to carry Joel up the mountain. I know he would have done this hike as well, if he could. I think he was a very special man with a kind heart. Your family is amazing doing this non-profit program. I couldn’t imagine having a relative pass away and getting over it. You are all very strong and I hope you know that you’re doing a good thing by him with this stone. I will always carry his legacy. “It was a great honor to carry the stone of Joel House. It was also a learning experience. As a young child my Dad went to Iraq and it never really clicked that he might not come back. Thankfully my Dad came home, but I am sorry that Joel did not. I cannot even begin to understand your pain and loss and the struggles that you go through but I would still like to offer my small words of apology for the loss of such a great young man. I wish you all the best..
My name is Karen Staples and I had the honor of carrying Sgt Joel House’s story and stone up Bradbury Mountain on November 20, 2016. This hike was an opportunity to share Sgt House’s memory with a small group of Naval Academy Midshipmen who had the opportunity to learn about the Summit Project and our Fallen Heroes from Maine. By sharing Sgt House’s story with them it allowed them to also connect to a fellow soldier that was similar in age where he was killed in action at the age of 22. Sgt House greatly enjoyed the outdoors and liked to spend his time at his family’s camp in Lee. As a continued remembrance, his family has started a summer camp scholarship so that all children can enjoy Maine’s wilderness the same way Sgt House did. I was able to connect with him and his family in knowing this because I feel all children should have the chance at this experience and this allows his memory of the great outdoors to continue through generation after generation. My name is Zach Glidden I attended Nokomis Regional High school. I’m a sophmore in highschool i’m also apart of JROTC. The program allowed me to participate in the summit project. This is where you carry a stone that the family of a fallen Maine soldier in honor for his services and to let his/hers family know that their life was not taken for granted. We hiked Little Bigelow it was a 6 mile hike up and down altogether. I carried Joel . A . House’s stone I was very honored to carry his stone. I was honored because I was able to remember and allow others to remember this fallen hero. Doing this also let me show that I care that he sacrificed his life for not just me but for everyone in this country.For this reason we should never forget what these brave men and women did for us. It was a great honor to carry his stone! my respect to him and his family. My name is Camden Ege and I had the distinct privilege of carrying Joel House’s stone and memory at Baxter State Park. In my time post-service back in Maine I’ve had the opportunity to get to know Luke and his parents. As such, I’ve been fortunate to hear a lot about the type of person Joel was. He was a quiet, simple man who enjoyed the outdoors very much. His stone was even collected from the lake where he learned to swim and kayak. When I received Joel’s stone on Saturday I was immediately overcome with a strong sense of familiarity. I have been around the stone before, so I recognized the smoothness, the scrapes, and the weight. More than the just the stone, I think this represented my thoughts towards Joel. His family, House in the Woods, and The Summit Project have all done such a great job keeping his legacy alive that I feel I know him. As I hiked on that beautiful Sunday, thoughts of Joel flowed through my mind. This was my first venture up to BSP and I feel it showed me some of the outdoors life that Joel enjoyed so much. I can’t imagine he wouldn’t have enjoyed the peacefulness of the environment, or the stunning view from the summit. This isn’t to say that it was just another Sunday stroll through the park, but the memory of Joel helped push through the pain. My weekend began with a text conversation with Luke where he told me “the family appreciates it.” After hearing that and interacting with other Gold Star family members it quickly became clear how powerful of an event this is. This is what Memorial Day is all about and I couldn’t be happier that I participated. I would like to personally thank you for sharing Joel and his life with us and others who take part in this amazing program. On August 11, 2017, I had the distinct privilege to carry the stone honoring your son, Army SGT Joel House, as I climbed to the top of Mt. Katahdin with my daughter who carried her own Summit Project stone in memory of another Maine fallen hero. I selected to carry Joel’s stone after learning of the worthy commitment you have made to honor his sacrifice with the establishment of the House in the Woods project as well as after listening and learning how your summer camp was such a wonderful part of Joel’s life and that of his entire family. Although residing and raising my family in southern Maine, I was raised in “The County” where my large extended family still maintains my parents’ lakeside summer camp and our north woods hunting camp for all to enjoy. I felt a real connection to Joel and to you due to my own deep appreciation as to how lucky we are to have such special places where so many joyous and lasting memories were and continue to be created and shared and where family bonds are forever forged to a new generation. And with the noble mission of the House in the Woods, deserving military families are able to experience what we have been so fortunate to have – what a fitting tribute to Joel and his legacy. As for the hike and climb up Mt. Katahdin with Joel’s stone, I can honestly say that his spirit was certainly with me that day. While on the trail with more than a mile to go to reach the summit, we encountered a horrific thunder, lightening and hailstorm. Although fully exposed to the cold elements, we elected to try and wait out the storm to the disbelief of many hikers scurrying down the mountain. As stiffness developed due to the extended length of our wait, my thoughts were solely on Joel, his courage and commitment to our great country. As the storm lightened, we continued the climb. As I lead the way to the summit, I felt Joel’s strength with each step. Occasionally, my family members called out to me to slow down but my legs could not move fast enough as if I was being lifted. We reached the summit of Baxter Peak under clearing skies and it was with great pride and admiration for Joel that I held his stone while atop of Maine’s cherished mountain and the vast wilderness and waterways below which Joel surely treasured. I will always cherish and reflect on this special climb in memory of your son. It was an incredible honor to carry The Summit Project stone of Army SGT Joel House. It was a great honor to participate in the Summit Project on September 11, 2017 and to carry Army Sargent Joel A. House’s stone from USM’s Portland campus to the Gorham campus. Prior to the walk, I learned as much as I could about Joel. I felt a real affection for him, as some of his qualities, experiences, and values reminded me of my own son, now age 22 and recently enlisted in the Army. My affection and respect for Joel—and his family–grew as I walked several miles in the company of his brother Luke. Luke shared memories of Joel and his family and told me about the House in the Woods. I am humbled and inspired by Joel’s service and by that of his family (and others) in creating House in the Woods. A sincere thank you to the House family and the Summit Project for the privilege of “meeting” and honoring Joel House. My name is Kaelyn Cloukey. I live in Lincoln, Maine with my parents, Justin and Jessica, and my little brother Blake. I am 9 years old. On October 5th, 2017, I hiked Cadillac Mountain at Acadia National Park with my daddy. I carried the stone and story of Army Sargent Joel House. My dad thought I was going to be nervous about the hike, but I wasn’t at all. When I woke up, I was trying to get ready as fast as I could because I was really excited for the hike. This was only my second hike I’ve ever done. My parents took me to Chimney Pond a couple of years ago and I loved it. The morning went by so slow because I was impatient waiting for the bus. It turns out it was a really long bus ride, longer than the one home from school. Whenever we listen to national anthem in the morning, I think about the soldiers every single time. I know about Joel through House In The Woods and Paul and Dee. Dee has taken me to their house once and showed me some of Joel’s things. He used to play guitar, which I think is pretty cool. When I was hiking, I thought about Joel. It made me feel happy because he was fighting for our country and he loved doing it. I had 2 goals during the day: I wanted to touch a cloud and I wanted to reach the summit. We got lucky because it was windy and cloudy near the top of the mountain, but it wasn’t what I expected to be in a cloud. I thought it would be fluffy, white and not able to see anything. When we were on the mountain, I kept saying to myself, “A soldier never gives up, so I won’t either”. If I got tired, or even if I wasn’t, I kept saying “Maine Heroes Are Not Forgotten” under my breath. When I got back to base camp, I couldn’t wait to tell my friends about the journey. I was excited to talk into the microphone, but the closer I got, the more nervous I became. Thinking about Joel and how brave he was made it easier. I got to present Joel’s stone to his mom, Dee, and she gave me a great big hug. To Paul and Dee, Joel was a very brave and kind person. I got to learn a lot of new things about him and I got to have a really good experience with him. My name is Cloyd Tavenner, and I had the privilege of carrying the stone and the story of Joel on 27 May 2018. It’s amazing to me that he has passed now these 11 years, but his legacy is stronger than ever. You have positively impacted the lives of roughly 900 veterans with your “House in the Woods” Military and Family Retreat initiative, in his name. I’ll always remember my time on the Owl trail at Baxter, speaking out on behalf of what I had thought I learned of him, and what I had drawn of it. Truly, Maine Heroes are Not Forgotten. When I researched, I came away with the same impressions many did regarding Joel. As a transplant to the state, I commented that I found him to be a true Mainah. It seems the true Mainah finds his peace in Nature, hunting and fishing. A true Mainah will leave a relatively sparsely populated, minimally commercialized area for a much lesser populated area 4 or 5 hours away, to get away from it all. In “Maine-abama”, the music is Southern Rock, of which Joel was a fan. I mean no offense, I happen to be a musician who plays music with a lot of fellow Mainah’s, so I’m starting to get it. It is starting to remind me of a colder version of Benning Georgia and my time down south. Anyways….I guess I see him as a true son of Maine, endowed with the strengths and habits, likes and hobbies that define the State. What intrigued me in my research were a couple of key points that you made regarding his experience with international kids at an early age, and his offense to 9/11, and the calling he felt to serve his country that came from it. It is amazing to me that a kid from Lee could grow up with so much international exposure, and I’m certain he was the richer for it. I wondered about his time in Taji, a real gem of a location. During those years, Taji saw heavy insurgent action, and EIDs were frequent. That can’t have been any kind of comfortable environment to be in, and I wondered how it was for him to see his friends injured and taken by the enemy, and if he had a broader perspective of the local Iraqis. Talking to some of my friends who spent time over there, some had sympathy for the many locals who were just trying to survive, trapped between occupiers and militants, truly harsh. I wondered if he had felt empathy for those that were just trying to live. This led me to a broader consideration of the challenges we face as “rebuilding occupiers”. The job is tough. I wondered what he felt during a regular patrol, what combination of emotions governed his day. On the climb and at the summit I did remember a classmate of mine, 1st Lt USAR Terry Plunk, who died in Desert Storm in 1991. He was 25 when he passed, and I thought, man, he is forever young….I’ve been looking at his picture for years, a good man, ….Didn’t get to experience the aches and pains of climbing the Summit. Just a little bit older than Joel. One thing I don’t wonder about though, is that the end of this life is not the end for Terry, and not the end for Joel. Like Terry, Joel was a devout Christian, and his faith has certainly been rewarded. I’m very sorry for your loss, even all these years later. I can’t imagine what its like waiting to be contacted by the Casualty Assistance Officer. Adversity builds strength of spirit, and your strength is evident and marvelous to behold, in the legacy you have created to honor your son, and in the impact you have had in the lives of others you have brought some peace and comfort to. I Apologize this was a bit of a ramble, I’m told that’s okay. I’ll carry his memory along with the other friends I’ve had that have fallen in Service, and really the friends that I’ve lost outside of Service. Memorial day will always be a bit different for me now. In regards to the general TSP experience, it was truly humbling to be in the presence of these Gold Star families, showing their strength, their humor, their appreciation for the simple fact we came to spend the weekend with them to remember their loved ones with them. It’s a great initiative, and one I’ll continue to support. It was great to join the presence of so many prior service, to share a drink and a laugh, it brought me back. Thanks to TSP, God Bless our Servicemen and Women, and our Fallen Warriors. My experience is still sinking in. This year I had the honor and privilege to carry the stone of Joel House. It was a fulfilling day to be part of this event. The weather was perfect! I can’t imagine being home one day and that vehicle pulls in with the worst news of your life. I enjoyed talking about Joel and the man he was. I am sure if he was here today to see how proud his country is and the respect for his ultimate sacrifice for the freedom which we all enjoy it would make him happy. His memories will be shared for a long time to come and I am sure that I will be back to take part in another hike helping keep the fallen soldiers legacy alive. Mr & Mrs House I am sorry for all your loss and am very grateful to the service and sacrifice that Joel has made. May he forever rest in peace!